College and other education expenses can be some of the most burdensome costs you will ever face. Families may find themselves shelling out tens or even hundreds of thousands of dollars to universities, and many will spend even more on private elementary and secondary schools. Saving for these education expenses is increasingly crucial, with some people even turning to their individual retirement accounts to help. IRAs have nice tax advantages and have long been used as a possible vehicle for college savings. But is it a smart idea to use an IRA to pay for college? Using a retirement account for this purpose could be helpful, but has a number of drawbacks. Consider these reasons to avoid using an IRA for education expenses, if possible. Ideally, you want to save for both retirement and your child's education. But you should try to avoid letting education savings cannibalize your retirement savings. The last thing you want is to aggressively fund education accounts, only to find yourself unable to retire when you want to. You can save for retirement or you can save for college. But it's a bad idea to try and save for both in the same account. That's because you are operating with different time horizons in mind. If you are saving for your child's college tuition, you will likely need that money in about 18 years, at most. Retirement, on the other hand, might be 30 or 40 years away. This difference in timelines means that you will ideally be invested in different things. The college savings plan should contain more conservative investments than a retirement plan because you will likely need the money sooner. Using an IRA to save for college would be more acceptable if there weren't better options. Most states offer 529 college savings plans, which are designed to specifically save for education costs, and offer some great tax benefits to account holders. With an IRA, the only person who can contribute to the account is you. But a 529 plan allows any person to open an account and name virtually anyone as the beneficiary. This means that grandparents can set up 529 plans for their grandchildren. Individuals can set up plans for the children of close friends. You can even set up a plan and name a complete stranger as a beneficiary. Using a 529 plan instead of an IRA allows a broader set of people to help out with a young person's education expenses if they choose to. If you choose to make withdrawals from an IRA to pay for college, that money will be counted as income for financial aid purposes. This is not the case for 529 plans. Money in a 529 plan is generally considered an asset (but only about 5.6 percent of the total account balance), and assets don't count as much as income. Withdrawals from 529 plans are not recorded in the Free Application for Student Aid (FAFSA), so having money in these plans won't severely hurt your beneficiary's chance of receiving financial aid. Using an IRA to pay for college, however, could reduce the amount of financial aid your child receives. Yes, you can withdraw money from an IRA to pay for qualified educational expenses. But it's only the contributions, not the gains, that can be taken out without being taxed before age 59½. For example, let's say you have placed $40,000 into a Roth IRA, and that money has grown to $100,000 over time. Only $40,000 can be removed without paying taxes. Any additional funds will be taxed as normal income. With 529 plans, there are no taxes on any withdrawals as long as funds are used to pay for education expenses. 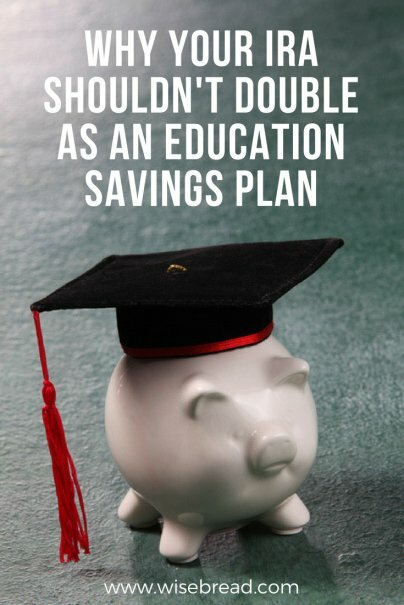 Some 529 plans do have limits on the total amount you can have in an account at one time. Read the fine print of each plan to determine how that might impact you.